It’s been quite a few weeks for the Toronto Blue Jays. To the cheer of the Blue Jays faithful, the offence has finally been found, which has helped the team go 12-5 in their past 15 games. This weekend was no different as they took on the Boston Red Sox at Fenway. Things started off Friday night as the knuckleballer R.A. Dickey was lights out. David Price would be the one to try and stand in his way, but would get knocked down early. Dickey would not give up a hit to the Red Sox, until the sixth inning. The Jays would help offensively scoring 2 runs in the top of the first inning, thanks to Edwin Encarnacion. He would send one into the stands in center field scoring Josh Donaldson as well as himself. In the bottom of the inning, Mookie Betts would find himself on base after walking and would eventually score cutting the lead in half. Fast forward to the eighth inning, and the Jays would manage to add two more runs on the board, winning Friday’s contest 5-2. On Saturday, Marcus Stroman would be sent to the bump as he would look to continue his team’s streak. However, he would soon discover he had been figured out by Boston’s offence, as the Red Sox would score in five consecutive innings. His competition across the field would be Steven Wright. Wright would find his defence putting in the work as a Jay would not see the plate until the top of the fourth inning. The Blue Jays would then score in three consecutive innings, but would still fall short by a pair, losing Saturday afternoon 6-4, managing only four hits through nine innings. Sunday would be the rubber match. There was a lot of excitement surrounding Sunday’s game as it got started. 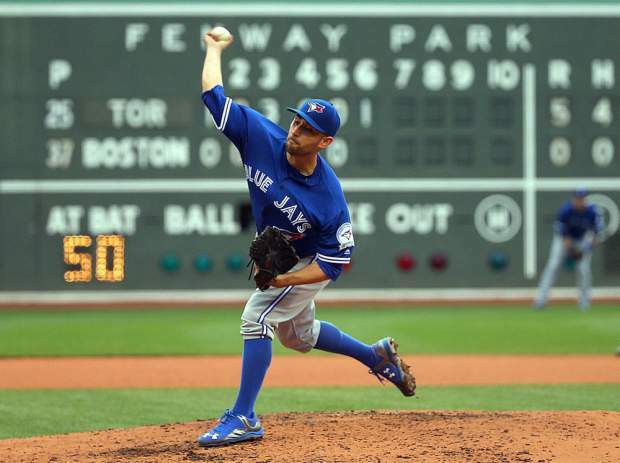 Marco Estrada would be on the hill for the Jays as he would face off against the young gun, Eduardo Rodriguez. The Jays offence would be a major factor, but not because of singles, doubles, or even triples. Jose Bautista started off in the first inning, getting a hold of one and homering in left center field. Heading into the third, Darwin Barney and Encarnacion would both homer respectively, scoring an additional three runs, making it a 4-0 game. It would then be Russell Martin’s turn to fire one into center field, giving the Blue Jays a 5-0 run. Defensively, Estrada had himself a game. The debatable ace of the team would find himself going into the bottom of the eighth, as he had a no-hitter intact right up until the bottom of the eighth inning before giving up a home run to Chris Young. Young’s home run would then light a fire on Boston’s bench. Leading 5-1 going into the ninth, and just three outs away from a win, Roberto Osuna would come in for the ninth. David Ortiz would hit a line drive, scoring Dustin Pedroia. Hanley Ramirez then doubled, scoring Rusney Castillo. Jackie Bradley Jr. then singled, scoring Ramirez, but that is all that would take place as the Jays would be able to hold on, and win the series 2/3. The Blue Jays now head into Detroit to start a three games series at Comerica Park. J.A. Happ (6-2) will be sent to the mound as his opponent will be Michael Fulmer (5-1).